Ralph, our esteemed “second in command” joined the team in 2015, after 17 years of dedicated service at a regional bank. 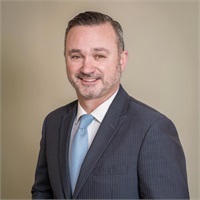 His commitment to guiding clients to reach financial success is tangible as he is a five time recipient of the Connecticut Five Star Wealth Manager award. His Certified Financial Planner, CFP ® designation helps too. In today’s ever changing financial environment, being properly informed is key. As our resident “nerd,” Ralph’s always striving to be better informed across all products and platforms in order to help our clients feel secure on their road to retirement. In Ralph’s free time, he enjoys coaching youth basketball and baseball in Norwich. He also serves on the finance committee for the advisory board at St. Patrick's Cathedral School. When he’s not setting up drills or sitting at a conference table, you can find him at the beach with his kids, or enjoying the outdoors. FACT or FICTION: Ralph loves to cook.